I’ve hesitated to write this post for awhile now, because I really don’t want to write something that makes you, the reader, feel guilty. I want to inspire you to explore the topic of sustainability; I don’t want to beat you over the head with facts about pesticides that will scare you into buying organic. No one I know has this completely figured out. No one I know is living a 100% sustainable lifestyle. What I want to focus on is how to do the best you can with what you have. This has been my motto of late: to consistently move toward a more sustainable lifestyle, to cause as little harm to the earth, to others, and to myself as possible. Sustainability is a huge topic and can be very intimidating. When I started to research it, I became overwhelmed with all the things I’ve been doing ‘wrong’, and started to panic and try to fix everything at once. This became disastrous and made me wish I never had started looking into it in the first place! I’ve dialled back a bit and I’m now trying to adjust one section of my life at a time. Here are the three sections of my food intake that I have recently committed to sustainable practices only. One of the biggest criticisms of the Paleo lifestyle is the increased amount of meat intake. If you are buying your meat at Superstore, Walmart, or many other large grocery store chains, then yes, I have to agree with this criticism. We’ve all heard the rumours of what goes on in those factory farms. If the Pink Slime incident doesn’t disturb you, maybe the treatment of the animals on those farms will. Maybe the rumour of arsenic being fed to chickens might cause you to think twice. Don’t care about animals? You might care about the way it affects the earth, you know, that same earth your children and your children’s children have to live on. In the past year, we have slowly made the transition from buying our meat at Costco to buying our meat from a local butcher shop. Everything in the store is nitrate free, almost everything is sugar free, and as locally sourced as possible. There are no hormones or antibiotics fed to the animals. They are free to roam in the pastures and eat grass. The animals are not abused in any way. Yes, this kind of meat costs more than factory farmed meat. In the beginning, this was a difficult choice for our family to make, as we keep to a very strict budget. However, the more I researched, the more my conscience would not allow me to wane from this decision. For those of you who can’t afford this kind of meat, this is one of those areas where I urge you to do the best you can with what you have. When you can and as often as you can, choose humanely treated, grass fed, hormone free meat. One of the ways we are cutting back on meat costs this year is investing in a 1/4 share of a cow. Information on the company we are using can be found here, but there are many other farms doing the same thing. Find one that works for your budget and your family. For eggs, we currently buy two dozen eggs per week from a local farmer in our neighbourhood who allows his chickens to range free. They cost half the price of the organic, cage free eggs from the store, and when we go pick them up in the morning, the eggs are still warm and fresh, rather than having sat in a warehouse for weeks. It’s one of Charley’s favourite things to do and I love that she gets to see the chickens and learn where her food comes from. 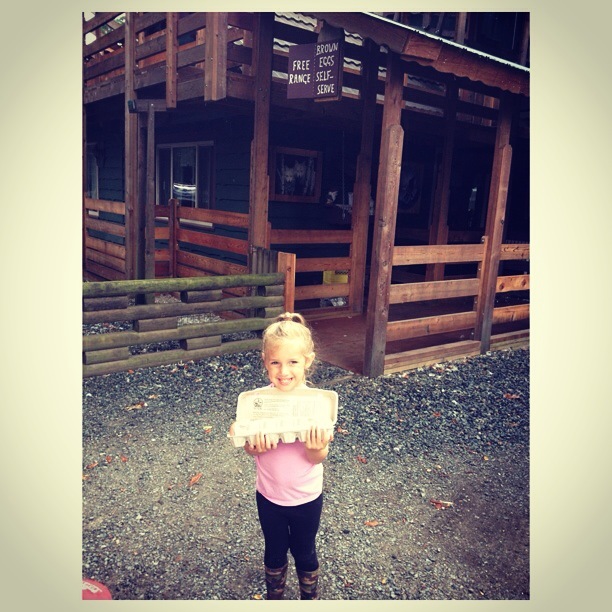 Ask around your community or go online to find a local farmer who sells eggs. I found this farm by posting the question on Facebook. For fish, we have a share in a CSF – Community Supported Fishery. Huge thanks to my talented friend Liz Johnson who invited us to be a part of it. We have been so thrilled with this program. Previously I found it difficult to justify the cost of wild fish, but this program has made it possible for us to enjoy fresh, wild salmon two or three times a week (seasonally). We’ve also had a lot of fun as a family learning about where our fish comes from and learning how to eat it. It’s been a great experience for Charley and she now eats salmon with minimal complaints, which is nothing short of a miracle in our household. Click here to check out the program we are a part of. 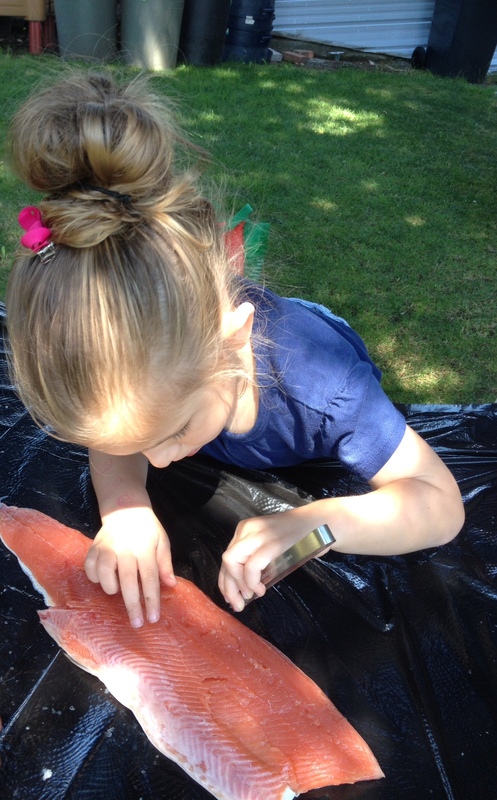 Charley helping fillet our fresh, wild and sustainably caught pink salmon. For produce, I focus on buying seasonally, local and organic whenever possible. This can get expensive if you are not careful. I did some research and shopped around to find the best prices, and have found that in my surrounding area, Two Ee’s Market is one of the best places to buy. This year we signed up with a CSA program – Community Supported Agriculture. I googled ‘CSA Langley’ and after looking through a bunch of options that came up, I chose Glen Valley Organic Farm. 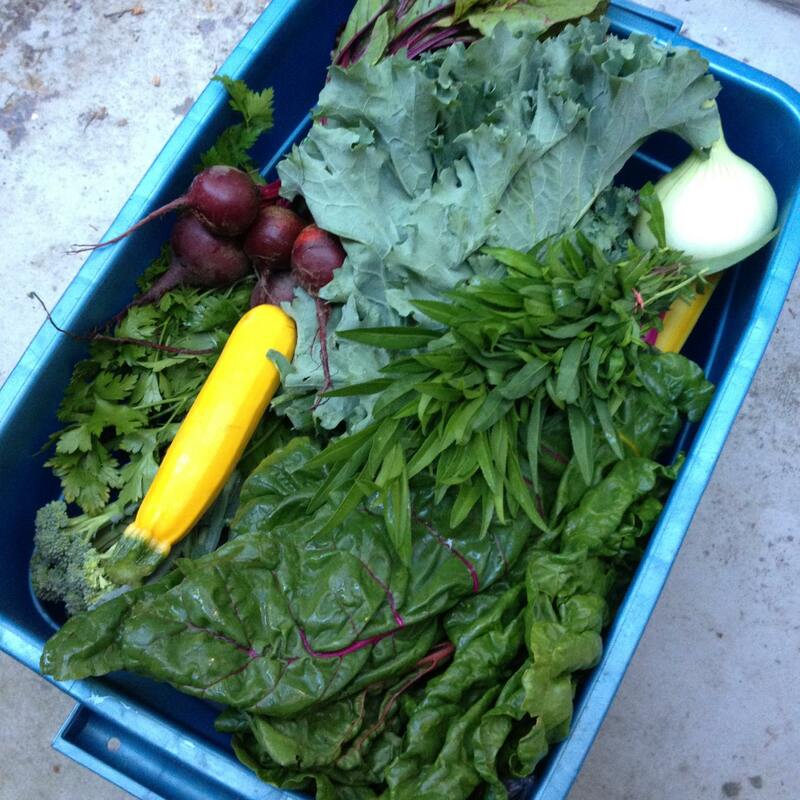 Each week they deliver a huge box of local, seasonal, organic produce right to my doorstep. With careful meal planning, I only need to pick up 2 or 3 things at the market each week in addition to what comes in our box. We are saving 20-30 dollars a week with this program! There are many options and farms to choose from, depending of course on where you are located. This is one week’s delivery, at my door step. If a CSA program is not possible for you and if you are concerned about the prices of local/organic produce, check out this list to help you decide where to spend your money in the produce section of your grocery store. I recently read an eye opening article on how some of our food choices are unintentionally promoting child slavery and other horrible things on a great blog called Sustainable Dish. (Read the article here.) I have yet to tackle the banana issue, but am now striving to only buy fair trade or direct trade chocolate and coffee. I drink one cup of coffee every morning, and I love dark chocolate for a treat now and then. These are areas that are easier to take on sustainably, if you’re not drinking multiple pots of coffee per day or consuming multiple chocolate bars a day. One of my favourite brands of chocolate is Green & Black’s. Their chocolate is a truly ‘guilt free’ treat. For coffee, there are a lot of options out there. A couple of my favourites are Kicking Horse and Ethical Bean, but do some taste testing and find your own favourite. I could talk with you for hours about these things and discuss so many more reasons behind it all. If you want to delve deeper into this or if you have questions, please leave a comment or email me at wellness@wellnesswithjoanna.com. If you’re feeling guilty or overwhelmed, relax. Remember, do the best you can with what you have. When you can, make the best choice for you, for the earth and for others. Be intentional in your choices and where you spend your dollar.